Late Adyar Gopalakrishna was born on 21st September 1906 at the Adyar Village, situated about 8 kilometers from central maidan in the port city of Mangalore on the west coast of Karnataka State, India. Parents of Adyar Gopalakrishna Shenoy were Adyar Manjunath Shanbhogue and Kamala. Kamala's maiden name was Yamuna. Yamuna was the eldest daughter of Mijar Annappa Kamath. Gopalakrishna married Amba the eldest daughter of Mijar Manjunath Kamath. Manjunath Kamath was the younger brother of Yamuna. Therefore the marriage of Gopalakrishna and Amba was a "Maulo-Bhachcho Soirika". Daughter of the uncle married the son of his sister. Our society has no bearers, no directors, no managers and no committees of any kind. It is a group of people that are equal in status. Dr. Mohan Shenoy is the Convener of the Parivar and Registrar of the conferences. No funds are collected from any member and no donations are accepted.All funds are spent from Dr. Shenoy's pocket. That is how he gives back to the society. This website is non-commercial. There are no sales of goods and services through this website. No membership fees are collected from the members or from any person. No donations or charitable contributions are accepted. The website is entirely funded by Dr. Mohan G Shenoy from his own sources. Privacy matters: Any one who does not approve of their information, photos or videos posted in this website can write email to Dr. Mohan G Shenoy at [email protected] for deletion of the same. Upon receipt of the request for deletion such matter will be deleted without delay. I have tried not to post anything that normally disliked by members of our community. Also we are publicizing our parivar activities only and not of individual members. There is no interest of any kind to the general public to get to know details about our parivar or what happens at the annual conferences of the members. Adyar Gopal Parivar is published on the web and so it will all be available to the public at large. For queries please call Dr. Mohan Shenoy, the Convener of the Parivar at +91-80-26797278. Family Lines: Adyar Manjunath family, Mijar Annappa Kamath family, Sampige Madhavray Kini family, Manchkal Lakshman Kudva family, Bantwal Baddakatte Ramachandra Kini family, and Mijar Madhav Shenoy family are the only families discussed in this website. Adyar Gopal belongs to the Adyar Manjunath family. Conventions: Annual conventions were held every year from 2007 onwards. There are details, photos and videos of these conventions in this website. Other contents: There are articles written by me expressing my opinion on various subjects. There are details of my travel to various tourist destinations along with photos and videos. There is a page displaying the front covers of books authored by me and brief descriptions of their contents. There are links to the merchants from whom the books can be purchased. What do you see in this website? This is a website of the extended family of a man who lived in the 20th Century in Mangalore. His name was Gopalakrishna, aka Gopal. He was born in Adyar village now within the Mangalore City Corporation. In short this extended family consists of stories of the ancestors and descendents of Adyar Gopal. I am a son of Adyar Gopal. Disclaimer: In this website there are details of the families that form the Parivar, as collected by Dr. Shenoy over the years. The information he collected from the living elderly people is reliable but can not be taken as evidence in legal issues. This is not the place for authentic information needed for Law or in court cases. There are photographs and portraits of the members collected by him by either taking camera snaps of the photos shown by the present descendents or clicked by him whenever he met them personally during Parivar meetings, family functions and visits to their homes. But, nothing given in this website may be used as legal evidence. 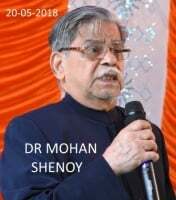 Dr. Mohan G Shenoy hereby disclaims any or all responsibilities for any harm suffered on account of such use of material from this website. I acknowledge that the music, vocal or instrumental in most of the videos in this website is borrowed from CDs and recordings produced by various Copyrights and that I am grateful to these Copyrights for their permission to use them. This website places advertisement of the members at no monetary consideration to the members of the Parivar. Contact Mohan Shenoy to place such advertisements and announcements such as the birth, death, wedding, etc., using email [email protected] or through feed-back.